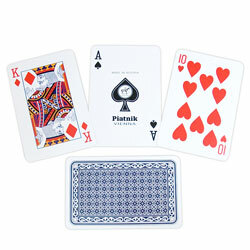 If playing cards hasn't been as much fun as it used to be due to low vision or tremors/muscle coordination, then these cards may help to bring that fun back Made extra-large with beautiful, big, bold, full-color graphics on a sharp white background, these cards are much easier to see than standard playing cards. The cards are also easier to handle at this size. Easy to shuffle, hold and deal. Cards are made of semi-coated card stock for stain-resistance and longer, more durable play. Each deck contains 52 cards plus two joker cards (54 total).